Well, in my usual fashion of being perpetually behind schedule, I created this card in belated honor of Earth Day. 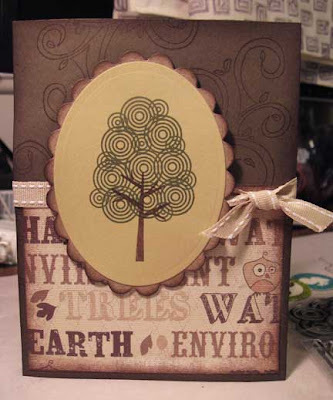 The main image uses two little stamps from a gel-a-tins stamp set, "Sheltering Tree". I'm really into tree images this year. And I'm seeing them in lots of new stamps set as well, so I'm guessing it's a trend. I plan to use lunch bags as the envelopes. Nifty, eh? On a more serious note, I received a call from a dear friend this evening who informed me that another friend of ours that we took several acting classes with was diagnosed in late March with stage 4 Brain Cancer. She is already in hospice care. Please keep her young family in your prayers. She will be survived by her husband and 11 year old daughter. It's just heartbreaking, because when she was around, she simply brightened the room with her presence. I'm so sorry for your friend and her family. Give them HUGS from me, please! On a happier note, I love your tree card. This is a unique tree with the swirls! Prayers for your dear friend, her family and you! Please find joy in your memories!! Great card! Love how you use the tree stamp for your bg paper too! !